Religion is unapologetic in its targeting of children, seeking to capture the minds of our youngest and most impressionable and mold them into their own theological cookie cutters. Seth Andrews' video of the same name addresses this issue briefly. 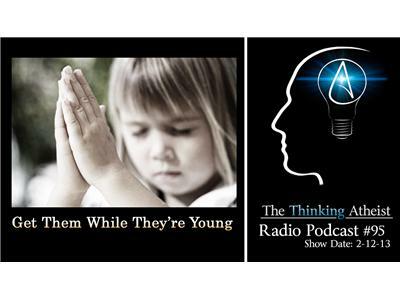 In this show, we explore many of the tactics used by Christianity and other religions to attract children, to indoctrinate them and to brand them with specific worldviews. We also speak with Edwin Kagin, National Legal Director for American Atheists and founder of Camp Quest, a secular camp that provides a superstition-free alternative for kids and their parents.